Growth and survival of the mammalian embryo within the uterine environment depends on the placenta, a highly complex vascularized organ comprised of both maternal and fetal tissues. Recent experiments demonstrate that the zinc finger transcriptional repressor Prdm1/Blimp1 is essential for specification of spiral artery trophoblast giant cells (SpA-TGCs) that invade and remodel maternal blood vessels. To learn more about functional contributions made by Blimp1+ cell lineages researchers from the University of Oxford performed the first single-cell RNA-seq analysis of the placenta. Cell types of both fetal and maternal origin were profiled. Comparisons with microarray datasets from mutant placenta and in vitro differentiated trophoblast stem cells allowed the researchers to identify Blimp1-dependent transcripts enriched in SpA-TGCs. These experiments provide new insights into the functionally distinct cell types present at the maternal-fetal interface and advance our knowledge of dynamic gene expression patterns controlling placental morphogenesis and vascular mimicry. 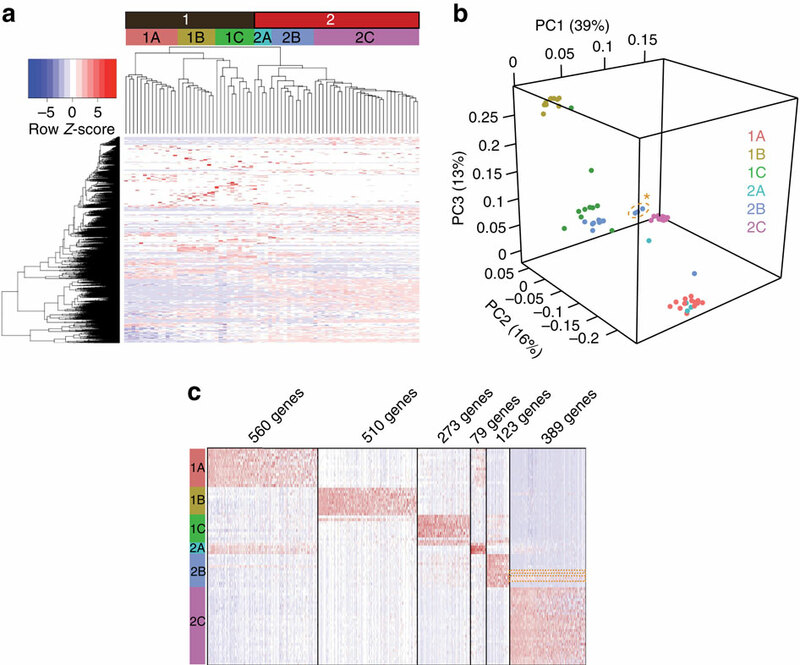 scRNA-seq analysis of Prdm1+ placental cell populations demonstrate transcriptional profiles characteristic of distinct cell lineages. (a) Hierarchical clustering of scRNA-seq data from 78 samples identifies two groups (1 and 2) with three clear subdivisions, totalling six molecularly distinct populations (1A–C and 2A–C). Colour coded header bars indicate the given identifier for each group. (b) PCA of significantly variable genes on the basis of linear dimensional reduction revealing key relationships between groups. (c) Heatmap of genes significantly enriched within each individual group (t-test; P≤1 × 10−3). Group 2B cells expressing endothelial markers are outlined in orange.